Player Showdown: Le'Veon Bell or David Johnson? Owning a high pick in your fantasy football draft can lead to a roller coaster of emotions. Obviously, there’s the excitement before the order is set, wishin’ and hopin’ for a high pick. Then when you do get that high pick, it feels like seeing your gifts Christmas morning. You have your pick of the best players available. But which gift do you open first? Fantasy football isn’t an exact science and it still comes down to your judgement. To compound matters, if you do a snake draft, you won’t be picking again for a while, so it can feel like the whole season is riding on that first pick. What started as elation has gradually turned to dread with all of your offseason research is culminating with this one pick. This may seem a little dramatic, but we’ve all been there. Which leads us to this week’s player showdown, with two players who need no introduction. If you have a top pick, there’s a good chance Le’Veon Bell and David Johnson will be at or very near the top of your list of candidates. Both have just about single-handedly won championships for fantasy teams in the past … so which one should you roll with in 2018? For starters, both are awesome. But how much awesomer (™) is one over the other? 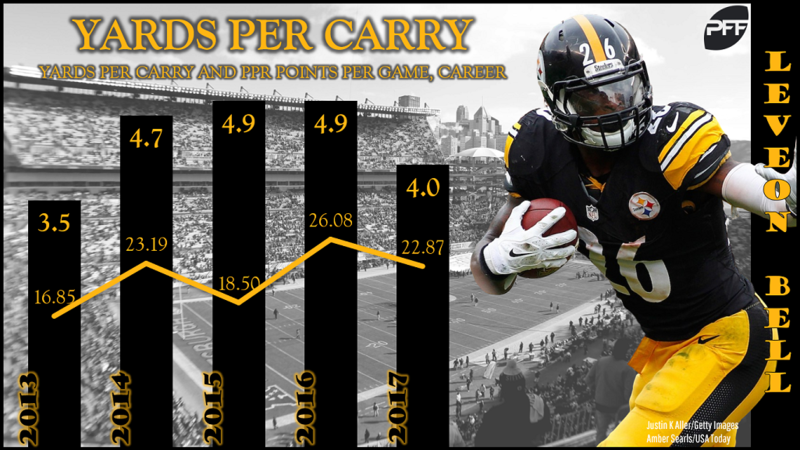 Bell has been a top-five fantasy option in three of his five seasons and is a model of consistency. Outside of his rookie season, he’s averaged a minimum of 85 rushing yards per game every year and has rushed for at least 1,200 yards in three of them. But it’s been his receiving numbers that have made him the fantasy stud he is today. He has at least three seasons of 600-plus receiving yards and, in his sophomore season, totaled 854 — the 12th-most all-time for a running back. Not surprisingly, that sophomore season was his best fantasy season to date, with over 2,000 total yards, 83 receptions, and 11 touchdowns. It was the 28th-best fantasy season ever by a running back. However, it’s fair to wonder if Bell has lost a step. To be fair, even lost-a-step Bell would still be a top running back. But (just for example) Bell had three straight seasons of finishing in the top-seven in PFF’s elusive rating between 2014 and 2016. He dropped to 18th last year. He also didn’t average less than 4.7 yards per carry during those three earlier seasons. His yards per carry last year? 4.0. Now remember that incredible sophomore season Bell had? What if I told you there was a season that was even better and it only happened two seasons ago? It was better than Chris Johnson’s 2,000-yard season and better than Todd Gurley’s championship-winning season last year. I’m of course talking about David Johnson’s breakout season in 2016, when he ran for 1,200 yards and also had 80 receptions for 879 yards (good for ninth all-time for a running back, by the way). Oh he also scored 20 touchdowns. The season was the ninth-best ever for a running back.